WHO IS JESUS CHRIST (A.S)?, HE IS NOT GOD, THEN WHO IS HE? 2- Jesus Christ a Prophet of God and Imam (high Priest) of the Children of Israel. Hebrews 6:20 where our forerunner, Jesus, has entered on our behalf. He has become a high priest forever, in the order of Melchizedek. 4-Jesus Christ (A.S) Prophet of God. Luke 24:19 “What things?” he asked. “About Jesus of Nazareth,” they replied. “He was a prophet, powerful in word and deed before God and all the people. 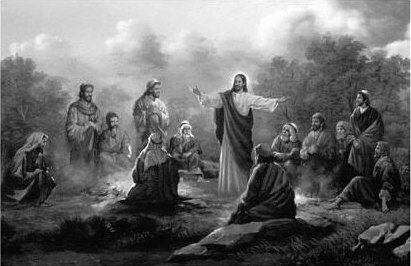 WHY JESUS CHRIST IS NOT GOD? 1- Jesus Christ (Peace be upon him) taught about God (Rabb which is written as “father” in Greek and foreign languages) is greater than him! 2- Jesus (A.S) Believed in God Almighty and did not consider himself equal to God! Hebrews 5:7 While Jesus was here on earth, he offered prayers and pleadings, with a loud cry and tears, to the one who could rescue him from death. And God heard his prayers because of his deep reverence for God. Some people quote Isaiah 9:6 to say Jesus is god! This is what it says in Isaiah 9:6 For to us a child is born, to us a son is given, and the government will be on his shoulders. And he will be called Wonderful Counselor, Mighty God, Everlasting Father, Prince of Peace. But What did Christ teach? I would suggest those who interpret verses to interpret with whole context than picking one verse from here and there! Matthew 23:9 And do not call anyone on earth ‘father,’ for you have one Father, and he is in heaven. see 1 Timothy 6:16 who alone is immortal and who lives in unapproachable light, whom no one has seen or can see. To him be honor and might forever. Amen. Mark 13:32 “But about that day or hour no one knows, not even the angels in heaven, nor the Son, but only the Father. 1 Corinthians 12:11 All these are the work of one and the same Spirit, and he distributes them to each one, just as he determines. Hebrews 2:9 But we do see Jesus, who was made lower than the angels for a little while, now crowned with glory and honor because he suffered death, so that by the grace of God he might taste death for everyone. Also in Psalm 8:5 You have made them a little lower than the angels and crowned them with glory and honor. Some people quote christ is god’s son by taking some verses out of context! But in the Old testament books, there are many sons of god, who are called as gods! Genesis 6:2 the sons of God saw that the daughters of humans were beautiful, and they married any of them they chose. There are many innovations in the written scriptures which even many Christian scholars agrees as alteration. Jesus Christ (AS) was not crucified or killed! It is clear that the man who was crucified on the cross was not Jesus Christ! Matthew 15:34 And at three in the afternoon Jesus cried out in a loud voice, “Eloi, Eloi, lema sabachthani?” (which means “My God, my God, why have you forsaken me?”). This kind of despised voice will not come from someone in whom is God and His Holy Spiri! See John 16:32 “A time is coming and in fact has come when you will be scattered, each to your own home. You will leave me all alone. Yet I am not alone, for my Father is with me. 2- God had Answered Jesus Christ’s prayer, in the Earlier days he thought he will die at the hands of his enemies , as he had spoken earlier, in the last days of his life on earth, God Answered his prayers. 3- Jesus Christ was raised to Heavens , enemies could not catch him! see John 8:21-23 Once more Jesus said to them, “I am going away, and you will look for me, and you will die in your sin. Where I go, you cannot come.”This made the Jews ask, “Will he kill himself? Is that why he says, ‘Where I go, you cannot come’?”But he continued, “You are from below; I am from above. You are of this world; I am not of this world. Job 8:20 “Surely God does not reject one who is blameless or strengthen the hands of evildoers. Comments: Jonah (A.S) was not wounded (crucified) nor was killed when the sea monster swallowed him, he was perfectly alright when he came out of the belly of fish. So when Angels lift Christ (A.S) from his enemies, he was a little drowsy in his body due to the supernatural event that took place. But he was raised to heavens perfectly as he was appearing that day!. Job 4:7 “Consider now: Who, being innocent, has ever perished? Where were the upright ever destroyed? comment: if this “some who will not die” is not Jesus Christ, then who is he? 1- People who do not believe in Jesus Christ (A.S) as a Prophet sent by God! see 1 John 4:2-3 This is how you can recognize the Spirit of God: Every spirit that acknowledges that Jesus Christ has come in the flesh is from God. but every spirit that does not acknowledge Jesus is from God. This is the spirit of the antichrist, which you have heard is coming and even now is already in the world. The original version of 1 John4:3 in the Bible is corrupted so, we avoid writing denial of Chirst! 2- People who eat pigs rats and other unclean things! 3- People who forsake God’s Law and Commandments (Prophets examples) establish their own practices in religion (Innovators)! See Ezra 7:26 Whoever does not obey the law of your God and the law of the king must surely be punished by death, banishment, confiscation of property, or imprisonment. Comments: Islam advocate to follow Laws and commandments as taught by the Last Prophet Nabi Muhammad alaihiswalathu wa salam. “You must listen to the Prophet who speak in My Name”. All those who claim to be Muslims, are not real Muslims. In an authentic Hadith (words) of the Prophet (alaihiswalathu wa salam) it is said that: “My nation will split into 73 sects, all of them are in hell fire, except one, he said “Al Jamah” (the Main body), which has Quran, Sunnah, Hadith, Ahlul Bayth, Companions, Imams, Shaykhs and unbroken spiritual lineage till the end of Day! So all those groups who miss some of this components of the religion of Islam is not “Al jamah” the Main body or Saved Sect! Therefore, the glorification God Almighty which gave to Christ (A.S) can be only understood as a reward for his sincere submission and reverence to God, as also teach in the Islamic Sayings and Sufi perspective of Annihilation in God through perfect sacrifice of the lower self (ego)! Muslims, Christians and Jews, all are cursed this days. Because they don’t follow the Holy commandments anymore. Religion is taken as a hobby. So punishment is coming on those who are given books. But Disaster is coming on disbelievers! May Allah Forgive and guide all people to the truth. May Allah’s mercy be upon believers. Ameen. It is a difficult and dangerous journey from womb to grave. Birth to death. Combating falsehood inside and outside is so much difficult this days. Only when inside falsehood is destroyed you can conquer outward falsehood! Today people want to destroy outward falsehood that is around them, day by day things getting worse. Because no one want to defeat falsehood inside them! So they are failing in personal life and falling to help the society! Hi Good morning 🌹We are happy and patient, because we know the Divine plan as informed by our Prophet Muhammad alaihiswalathu wa Salam and our Shaykhs. Therefore, we are not to fight or argue with anyone. The truth will prevail whether people like it or not. All this dirts that dominate falsely in the name.of Islam will perish. All these terrorism, radicalism disbelief hypocrisy, unbelief, double standard everything will come to an end. Today, all the radical elements from every religion and community are coming out bursting now. And it will perish by fighting each other or perish before they fight one another. When you scrub a used and tainted fry pan, the dirt and stains come out and then the fry pan is rinsed shining as new one. Same way all these bigots and terrorists and lawless ones from all religions come out and perish like how dirt in frying pan is perishable when scrubbed and rinsed. Then remain clean religions, and they will understand the truth and they all will accept the truth. One God One Religion and One Community. This will happen by the work of Mahdi Alahissalam and Messiah Jesus Christ peace be upon him. I am worrying that bigot Christians (extreme evangelicals etc) bigot So called Muslims (radical militants and preaching groups) radical Hindus,Zionists, extremist Buddhist monks, atheists (Marxists and anarchists) all together fight against one another and bring greatest calamities To humanity which have never seen before. Real believers. Stay away from fitna people. Be busy with Allah and His Messenger alaihiswalathu wa Salam. Go back to mountains and countrysides. Keep tongues and hands free from harming people. This is the message and order of the Messenger of Allah Nabi Muhammad alaihiswalathu wa Salam. Be the better son of Adam.Leave evil people and their world behind. Where is the wise person? Where is the teacher of the law? Where is the philosopher of this age? Has not God made foolish the wisdom of the world? For since in the wisdom of God the world through its wisdom did not know him, God was pleased through the foolishness of what was preached to save those who believe. Jews demand signs and Greeks look for wisdom,  but we preach Christ crucified: a stumbling block to Jews and foolishness to Gentiles,  but to those whom God has called, both Jews and Greeks, Christ the power of God and the wisdom of God. 25 For the foolishness of God is wiser than human wisdom, and the weakness of God is stronger than human strength. Deuteronomy 5:11 “‘You shall not take the name of the LORD your God in vain, for the LORD will not hold him guiltless who takes his name in vain. Deuteronomy 13:5 But that prophet or that dreamer of dreams shall be put to death, because he has taught rebellion against the LORD your God, who brought you out of the land of Egypt and redeemed you out of the house of slavery, to make you leave the way in which the LORD your God commanded you to walk. So you shall purge the evil from your midst. Comments: In 1 Corinthians 1:20-25 taking God’s name and God’s laws in vain. Zechariah 13:2 ESV And on that day,” says the LORD of Heaven’s Armies, “I will erase idol worship throughout the land, so that even the names of the idols will be forgotten. I will remove from the land both the false prophets and the spirit of impurity that came with them. 2 Corinthians 12:7 (NLT) even though I have received such wonderful revelations from God. So to keep me from becoming proud, I was given a thorn in my flesh, a messenger from Satan to torment me and keep me from becoming proud. Comments: Spirit of impurity coming on Paul (Messenger from Satan) a Godly person does not need Evil Spirit to keep him humble. But he is justifying his fate by interpreting it as a good cause. Read James 4:7. Comments: Paul breaking the commandments, 1- Do not go to Gentiles and Samaritans. Comments: 1 Corinthians 1:20-25 Paul mocking at laws of Prophets. Matthew 5:19 “Whoever then annuls one of the least of these commandments, and teaches others to do the same, shall be called least in the kingdom of heaven; but whoever keeps and teaches them, he shall be called great in the kingdom of heaven. below is the link to a Christian blog which spread venomous hatred and enmity to Islam and Muslims. If someone’s aim by writing this kind of blogs is to propagate their faith by attacking another faith, then it is most shameful act. It shows poverty of wisdom and intellect and deep rooted hatred against Islam and Muslims which has no real ground. Some of the posts I read here, very baseless and heinous, especially quotes from Orientalists, politicians and Hindu nationalists against Islam. However, such baseless words does not deserve answer. But the thing is this kind of blogs will promote racism, extremism and violence in young Christians and non-Christian population in Europe. People who read this without a rational study can fall into bigotry and skepticism! Does Christianity really need such hatred and lies against another religion to promote their faith? I would like to notify those who work with interfaith activities from Christian groups and Muslim groups look into this issues and communicate with those who are behind this indoctrination activities. If they have a problem with Islamic Laws which is more lenient than Old testament laws , I would suggest them to abandon those chapters in the Bible like Exodus 22:15-25 and then ask to ban Quran. This people are very immature, who are taking verses of Quran out of context and trying to spread hatred against Muslims and terrorize and panicking the British and Western communities!. Stopping/banning radical/hate preachers is very important in both sides. This is not just about one Anjem Chaudhary or a few sects! If the governments and Christian population did not stop Christian al Muhajoruns there will be great tribulation in the near future. Sitting a few middle class peaceful (Peaceful because they are affluent?) people and having a nice chat is not enough! Medicine should be given to sick and must combat illness!. Don’t just give tonics to healthy people. Bring in those who are sick and try to help them to get out of radical hate preach, and bigotry! Otherwise, next generation is going to bring blood bath in the Europe! Today we are fighting one ISIS, if all people become ISIS from every religion, there will be a few more years left for Western countries! Comments: Today, traditional Islam (Sunni-Sufi) Islam is appearing as very strange way to people. Zikr gatherings, turbans, old style life style etc making even 21st century Muslims to look upon traditional Muslims as strange people. On the other side many groups from among Muslims thriving and adopting life style that is contradicting the beautiful teachings of Islam. So the people are amazed to see traditional Islam (Sufi Islam), they are excited, some are looking at Osmanli Naksibendi Sufis as if they are seeing some people who came to their world from another planet! The world is familiar with many types of Islam, that is not real Islam!. So when they are meeting traditional Sufi Muslims, they are looking at excitement. Westerners they are excited about Istanbul, Konya (Mevalan Rumi) , Fes (Morocco), India Sufis etc! The Islamic groups the world is so familiar with today, they are fearing the coming of Sufi Islam, they are too attacking Sufi Muslims, especially Naqshbandi Tariqah. When Islam began, not everyone was a scholar, but they had learned proper respect, morals and manners, with Allah with Prophet (alaihiswalathu wa salam) and with the Khulafa Rashideen. But today, too much reading, so many educational institutions, so many scholars and teachers, but no manners, no respect, no morals , and no one including preacher practicing what is preached! Think about this situation today, which Prophet alaihiswalathu wa salam foretod 1400 years ago! Jesus ChristJesus in IslamWho is Christ?